James Lang having another very good game for Quins down in La Rochelle. Playing 12 outside Marcus Smith today, but looks very composed. A wee thought on props. Both Glasgow and Edinburgh did OK in the scrums this wekend - does that mean our fear over allthe missing props might be overstated? Six Nations is a different animal and a massive step up. The occasion brings out the best in teams. Or in our case our suicidal worst. I take it us losing to Stade meant the Dragons didn't qualify? RDW_Scotland wrote: I take it us losing to Stade meant the Dragons didn't qualify? Yup - thats Edinburgh. a team of massive helmets lead by a Klingon. Looking at Edinburgh's Pro 14 run in, we've been helped by Ulster's signing of Stephen Donald falling through (as he injured himself) leaving them without a top class 10. We don't have one either but every little helps! With the first 4 games happening during the 6N window. It certainly isn't an easy run in and we could find ourselves only winning 2-3 games, which puts us at risk of losing out on the playoff spot as Trevsio's run in isn't too bad. So it is going to be a real test of Edinburgh's new resolve under Cockerill as we're going to have to pull off some big wins - beating at least 2 of the Irish teams at home and picking up an away win or two. It may all come down to the last game against the great unwashed! 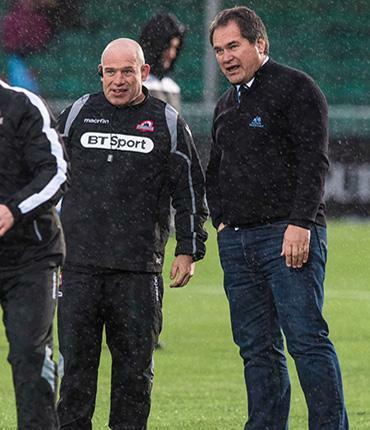 Edinburgh have a shot and certainly should be targeting Leinster at home when they are likely to miss their entire first team and some back-ups. Ulster will now be relying on a youngster to be the man to finish the season and John Cooney may be his back-up at this point needing to maintain a 3 point lead. Some tricky fixtures including Munster the day before the Calcutta Cup. Scarlets away will be a test of where the squad are as if they’re coming good then we should have ourselves a weekend in Dublin at the end of May. Glasgow have such a big lead in the conference that they can do a lot of squad rotation and still end up with a him semi final. Cheetahs at home during the 6N will be an interesting test but the Cheetahs haven't traveled well. Zebre home after the 6N is a good chance to rest the Scotland players with the cavalry being called in for the final 3 games (which I'm sure will have breaks for the Champions Cup playoffs) to give them some momentum leading up to the Pro 14 playoffs. I placed an order for 2 cases of wine at Oddbins on Mitchell Street to be delivered to a world class Ayrshire address on boxing day and apparently the snow was so bad they had to postpone the drive for 4 days. I know that this has nothing to do with rugby but I am trying to determine whether they were pulling my plonker or whether the snow really was that bad over Christmas. Well it snowed on boxing day GC but not as much as last week/weekend. As you know coastal Ayrshire usually not too bad. In summary not too bad over Christmas unless Ayr has an arctic micro climate. George Carlin wrote: I placed an order for 2 cases of wine at Oddbins on Mitchell Street to be delivered to a world class Ayrshire address on boxing day and apparently the snow was so bad they had to postpone the drive for 4 days. I know that this has nothing to do with rugby but I am trying to determine whether they were pulling my plonker or whether the snow really was that bad over Christmas. Oddbins is quite nice but why not use the Good Spirits Co instead? This is a shameless plug for my wife's friend's shop. It is genuinely brilliant shop though. I get a trip there each Christmas to choose a bottle of something. The one on Bath Street? Love it - bought a bottle of my local single malt there (Arran 18). I was also a big fan of the pretty, posh girl who sold it to me. That comma is relevant. Is the comma relevant because you bill extra for punctuation, George? Good Spirit Co is an absolute gem! I make a point of dropping into the gin section whenever I'm up in town. I do think the guy behind the till was taking the proverbial though, suggesting I garnish my G&T with mango and chewing gum. jimbopip wrote: Is the comma relevant because you bill extra for punctuation, George? Edinburgh QF confirmed for Sat 31st March at Murrayfield 1745 ko on Sky Sports. EWT Spoons wrote: Edinburgh QF confirmed for Sat 31st March at Murrayfield 1745 ko on Sky Sports. A cracking one here for grammar lovers. I was sent it recently. Relevant and necessary use of the apostrophe! p.s. 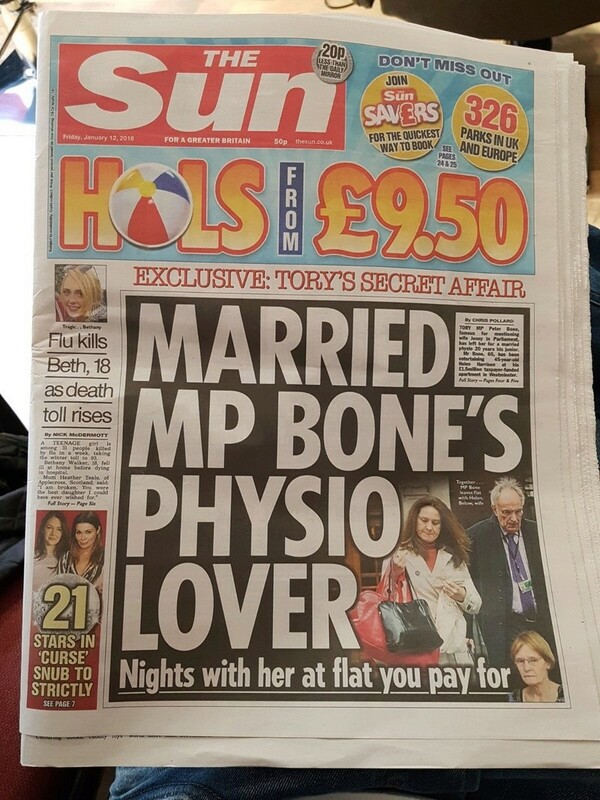 I do not buy/read The Sun! 21 Stars in 'curse' snub to strictly? Scotland 7s annihilate Canada 52-5 in the opening leg of the Sydney 7s, and they're no mugs. As a unit we looked like a fantastic 7s team, with Riddell and Cuthbert carrying powerfully and the backs showing great speed and flair. It was great to watch! Max McFarlend - signed by Glasgow on a partnership contract with the 7s - scored a hattrick and looks to have something about him. He's a similar build to Jim Fleming - slight but absolutely rapid. He's bigger than Darcy Graham though! They have a tough pool with USA and Australia still to come but they'll have a lot of confidence from this game. Kevin Bryce has left Edinburgh on loan to Carnegie. Claims to be a short term loan, but he's out of contract this season, so I assume that's him gone permanently. EWT Spoons wrote: Kevin Bryce has left Edinburgh on loan to Carnegie. He just needs to play some rugby and is never really going to get that chance at Edinburgh. We are still not sure if he can play prop or not, though it seems more likely to be not! We only had 2 tightheads left - who is going to bench now?? We still have Miller-Mills and Shields don't we? Forgot about Miller-Mills, although neither are exactly solid options. Berghan will be back soon unless he's picked for Scotland (which may depend on how the Wales game goes). I agree they are far from the greatest, but so far they've been better than Bryce, but that has been a fairly low bar. The Bath v Newcastle AWC game may well be worth a watch for any Scotland fans interested in the next generation of second rows coming through. The Newcastle pairing is Glen Young and Andrew Davidson with Callum Hunter-Hill who has been loaned to the Falcons for a couple of weeks, warming the pine and will hopefully get a decent run out as well. Newcastle clearly in need of a bit of second row cover and CHH badly in need of a bit of game time, so a good arrangement all round really. Jake Kerr and Luke Hamilton also starting for Leicester in the same competition this week. Hamilton appears to be moving on from the Tigers at the end of this season and seems to have been a little frozen out. He could do a decent job for Glasgow if they feel they need another back row and we probably do. Not sure if it has been reported on here but matt scott is being released by Gloucester at the end of the season. Rumours are he's heading back to Edinburgh. Majestic83 wrote: Not sure if it has been reported on here but matt scott is being released by Gloucester at the end of the season. Rumours are he's heading back to Edinburgh. Probably not helped his case that he's been injured most of this season. He was excellent for them last season. Assuming Rasolea is off I'd welcome him back with open arms, although we'd be fairly well stocked with centres. Scott-Bennett would be an exciting partnership! On that note he's on the bench for Gloucester tonight - apparently his injury meant he wasn't in the European squad. RDW_Scotland wrote: Scotland 7s annihilate Canada 52-5 in the opening leg of the Sydney 7s, and they're no mugs. As a unit we looked like a fantastic 7s team, with Riddell and Cuthbert carrying powerfully and the backs showing great speed and flair. It was great to watch! Disappointment for the 7s as the fall to defeats to USA and Australia - they were leading against Australia until a late try gave Aus the win. Watched the Aus game, which we did well to get back into and probably should have won, being 7 v 6 players on the last play before knocking it on. Max McPharland does have some serious wheels though, scary fast. Not sure what the rest of his game is like yet, but definitely one to keep an eye on. Not sure if good news that Scott is coming back to Edinburgh. Wasn't he leading try scorer last season for Glos? If he stays healthy, he blocks off a position pushing JJ/Dean down a spot in the order. If he does not, he is an expensive squad player. It is good news as it strengthens Edinburgh, it is bad news in reducing development time for JJ and Dean. Yeah he was Gloucester's top try scorer last session season! To be fair Burleigh's contract is up this season too - he's been a great servant for Edinburgh but is 30 now and professional sport is brutal. There's also less need for his steadying influence at 12 given we have proper 10s in VDW and Hickey next season. Are there rumours about where he might be off to? France or England? Is there a list somewhere of whose out of contract for both Scots sides? Rumours abound that it is a finals day at The Library on 28 April with our game last of 4 at 1930hrs. Not sure why and will cause problems for Warriors getting back to Glasgow with that KO time. Also thought that all the games had to be at the same time on final day ? Blizzare weekend for the 7s team with the wheels well and truly coming off after the first game. Having lost the remaining 2 group games they then lose to Russia in the losers cup, beat Spain in the bigger losers cup then lose to Canada in the final - the team they humped 2 days previously! 21st Century Schizoid Man wrote: Rumours abound that it is a finals day at The Library on 28 April with our game last of 4 at 1930hrs. Not sure why and will cause problems for Warriors getting back to Glasgow with that KO time. Also thought that all the games had to be at the same time on final day ? It's no rumour! Train's back to Glasgow run until 23:30 and there's busses until 5am! In theory, this is a great move by the SRU, playing the finals on the same day as the last 1872 game at BTMF. Should see a big crowd and from the sound of things they have a lot of stuff planned. Hopefully a team from the east and west make it to the final(s) to give both Glasgow & Edinburgh fans someone to cheer on. 21st raised a good point about kick off time - I also thought all games on the final day had to kick off at the same time. They definitely did in 2015 when we hammered Ulster in the last game as the top 4 changed 3 or 4 times as the games progressed with Connacht sticking it to Ospreys in the last minute and Munster confirming 2nd place. Maybe all the games will be an evening kickoff! Just read that Matt Scott is likely to be released by Gloucester in the summer. He'd be a great signing for Edinburgh imo and looked good playing alongside Bennett for Scotland a couple seasons back. reallybored wrote: Just read that Matt Scott is likely to be released by Gloucester in the summer. Yeah we discussed Matt Scott over the weekend on here - I'd personally be delighted if he moved back. Socino would be a great signing but I'd prefer local boy Matt Scott! Yeah. Although if both are an option I wouldn't complain. Especially if Bennett and Scott are away with Scotland, Socinio would be available during the 6 nations. Hardie made his long awaited comeback for Hawick at the weekend…..going off before 15 mins with a head knock that required plastic surgery.